On 7 August 1942, Allied forces, predominantly United States (US) Marines, landed on the islands of Guadalcanal, Tulagi, and Florida in the southern Solomon Islands, with the objective of denying their use by the Japanese to threaten Allied supply and communication routes between the US, Australia, and New Zealand. The Allies also intended to use Guadalcanal and Tulagi as bases to support a campaign to eventually capture or neutralize the major Japanese base at Rabaul on New Britain. The Allies overwhelmed the outnumbered Japanese defenders, who had occupied the islands since May 1942, and captured Tulagi and Florida, as well as an airfield (later named Henderson Field) that was under construction on Guadalcanal. 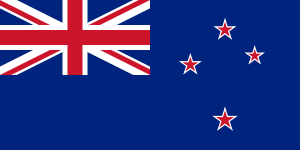 Powerful American and Australian naval forces supported the landings. Surprised by the Allied offensive, the Japanese made several attempts between August and November to retake Henderson Field. 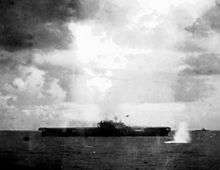 Three major land battles, seven large naval battles (five nighttime surface actions and two carrier battles), and continual, almost daily, aerial battles culminated in the decisive Naval Battle of Guadalcanal in early November, in which the last Japanese attempt to bombard Henderson Field from the sea and land with enough troops to retake it, was defeated. In December, the Japanese abandoned their efforts to retake Guadalcanal and evacuated their remaining forces by 7 February 1943, in the face of an offensive by the US Army's XIV Corps. The Guadalcanal campaign was a significant strategic combined arms Allied victory in the Pacific theater. Along with the Battle of Midway, it has been called a turning-point in the war against Japan. The Japanese had reached the peak of their conquests in the Pacific. The victories at Milne Bay, Buna-Gona, and Guadalcanal marked the Allied transition from defensive operations to the strategic initiative in the theater, leading to offensive operations such as the Solomon Islands, New Guinea, and Central Pacific campaigns, that eventually resulted in Japan's surrender and the end of World War II. On 7 December 1941, Japanese forces attacked the United States Pacific Fleet at Pearl Harbor, Hawaii. The attack crippled much of the U.S. battleship fleet and precipitated an open and formal state of war between the two nations. The initial goals of Japanese leaders were to neutralize the US Navy, seize possessions rich in natural resources, and establish strategic military bases to defend Japan's empire in the Pacific Ocean and Asia. To further those goals, Japanese forces captured the Philippines, Thailand, Malaya, Singapore, Burma, the Dutch East Indies, Wake Island, Gilbert Islands, New Britain and Guam. Joining the U.S. in the war against Japan were the rest of the Allied powers, several of whom, including the United Kingdom, Australia and the Netherlands had also been attacked by Japan. Two attempts by the Japanese to continue their strategic initiative and offensively extend their outer defensive perimeter in the south and central Pacific to where they could threaten Australia and Hawaii or the US West Coast were thwarted at the naval battles of Coral Sea and Midway respectively. Coral Sea was a tactical stalemate, but a strategic Allied victory which became clear only much later. Midway was not only the Allies' first clear major victory against the Japanese, it significantly reduced the offensive capability of Japan's carrier forces, but did not change their offensive mindset for several crucial months in which they compounded mistakes by moving ahead with brash, even brazen decisions, such as the attempt to assault Port Moresby over the Kokoda trail. Up to this point, the Allies had been on the defensive in the Pacific but these strategic victories provided them an opportunity to seize the initiative from Japan. The Allies chose the Solomon Islands (a protectorate of the United Kingdom), specifically the southern Solomon Islands of Guadalcanal, Tulagi and Florida Island, as the first target, designated Task One, codenamed Pestilence, with three specific objectives. Originally the objectives were the occupation of the Santa Cruz Islands, codenamed Huddle, Tulagi, codenamed Watchtower, and "adjacent positions". Guadalcanal (Code name Cactus), eventually the focus of the operation, was not even mentioned in the early directive and only later took on the operation name Watchtower. The Imperial Japanese Navy (IJN) had occupied Tulagi in May 1942 and had constructed a seaplane base nearby. Allied concern grew when, in early July 1942, the IJN began constructing a large airfield at Lunga Point on nearby Guadalcanal—from such a base Japanese long-range bombers would threaten the sea lines of communication from the West Coast of the Americas to the populous East Coast of Australia. By August 1942, the Japanese had about 900 naval troops on Tulagi and nearby islands and 2,800 personnel (2,200 being Korean forced laborers & trustees as well as Japanese construction specialists) on Guadalcanal. These bases would protect Japan's major base at Rabaul, threaten Allied supply and communication lines and establish a staging area for a planned offensive against Fiji, New Caledonia and Samoa (Operation FS). The Japanese planned to deploy 45 fighters and 60 bombers to Guadalcanal. In the overall strategy for 1942 these aircraft could provide air cover for Japanese naval forces advancing farther into the South Pacific. The Allied plan to invade the southern Solomons was conceived by U.S. Admiral Ernest King, Commander in Chief, United States Fleet. He proposed the offensive to deny the use of the islands by the Japanese as bases to threaten the supply routes between the United States and Australia and to use them as starting points. With US President Franklin D. Roosevelt's tacit consent, King also advocated the invasion of Guadalcanal. Because the United States supported Great Britain's proposal that priority be given to defeating Germany before Japan, the Pacific theater had to compete for personnel and resources with the European theater. An early obstacle was desire by both the Army and Roosevelt to initiate action in Europe. In addition there was an issue of command in which Tulagi lay in the area under command of General Douglas MacArthur while the Santa Cruz Islands lay in Admiral Chester W. Nimitz's Pacific Ocean Area which would also supply almost all offensive forces that would prepare and be supplied and covered from that area. Both were overcome and Chief of Staff of the U. S. Army, General George C. Marshall gave the operation full support, even if MacArthur's command could not lend support, and the Navy had to take full responsibility. As a result, and in order to preserve unity of command, the boundary between MacArthur's Southwest Pacific Area and Nimitz's Pacific Ocean Area was shifted 60 miles (97 km) to 360 miles (580 km) to the west effective 1 August 1942. The CJCS ordered for 1942–43 Pacific objectives: that Guadalcanal would be carried out in conjunction with an Allied offensive in New Guinea under Douglas MacArthur, to capture the Admiralty Islands and the Bismarck Archipelago, including the major Japanese base at Rabaul. The directive held that the eventual goal was the American reconquest of the Philippines. The U.S. Joint Chiefs of Staff created the South Pacific theater, with Vice Admiral Robert L. Ghormley taking command on 19 June 1942, to direct the offensive in the Solomons. Admiral Chester Nimitz, based at Pearl Harbor, was designated as overall Allied commander in chief for Pacific forces. The airfield at Lunga Point on Guadalcanal under construction by Japanese and conscripted Korean laborers in July 1942. 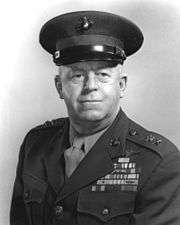 In preparation for the offensive in the Pacific in May 1942, U.S. Marine Major General Alexander Vandegrift was ordered to move his 1st Marine Division from the United States to New Zealand. Other Allied land, naval and air force units were sent to establish or reinforce bases in Fiji, Samoa, New Hebrides and New Caledonia. Espiritu Santo, New Hebrides, was selected as the headquarters and main base for the offensive, codenamed Operation Watchtower, with the commencement date set for 7 August 1942. 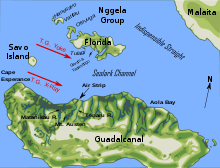 At first, the Allied offensive was planned just for Tulagi and the Santa Cruz Islands, omitting Guadalcanal. After Allied reconnaissance discovered the Japanese airfield construction efforts on Guadalcanal, its capture was added to the plan and the Santa Cruz operation was (eventually) dropped. The Japanese were aware, via signals intelligence, of the large-scale movement of Allied forces in the South Pacific area but concluded that the Allies were reinforcing Australia and perhaps Port Moresby in New Guinea. The Watchtower force, numbering 75 warships and transports (of vessels from the U.S. and Australia), assembled near Fiji on 26 July 1942 and engaged in one rehearsal landing prior to leaving for Guadalcanal on 31 July. The commander of the Allied expeditionary force was U.S. Vice Admiral Frank Fletcher (whose flag was on the aircraft carrier USS Saratoga). Commanding the amphibious forces was U.S. Rear Admiral Richmond K. Turner. Vandegrift led the 16,000 Allied (primarily U.S. Marine) infantry earmarked for the landings. The troops sent to Guadalcanal were fresh from military training and armed with bolt action M1903 Springfield rifles and a meager 10-day supply of ammunition. Because of the need to get them into battle quickly, the operation planners had reduced their supplies from a 90-days to only 60 days. The men of the 1st Marine Division began referring to the coming battle as "Operation Shoestring". Routes of Allied amphibious forces for landings on Guadalcanal and Tulagi, 7 August 1942. Bad weather allowed the Allied expeditionary force to arrive unseen by the Japanese on the night of 6 August and the morning of 7 August, taking the defenders by surprise. This is sometimes called the Midnight Raid on Guadalcanal. Japanese patrol aircraft from Tulagi had searched the area the Allied invasion fleet was moving through, but missed seeing the Allied ships due to severe storms and heavy clouds. The landing force split into two groups, with one group assaulting Guadalcanal, and the other Tulagi, Florida, and nearby islands. Allied warships bombarded the invasion beaches while U.S. carrier aircraft bombed Japanese positions on the target islands and destroyed 15 Japanese seaplanes at their base near Tulagi. Tulagi and two nearby small islands, Gavutu and Tanambogo, were assaulted by 3,000 U.S. Marines. The 886 IJN personnel manning the naval and seaplane bases on the three islands fiercely resisted the Marine attacks. With some difficulty, the Marines secured all three islands; Tulagi on 8 August, and Gavutu and Tanambogo by 9 August. The Japanese defenders were killed almost to the last man, while the Marines suffered 122 killed. During the landing operations on 7 and 8 August, Japanese naval aircraft based at Rabaul, under the command of Sadayoshi Yamada, attacked the Allied amphibious forces several times, setting afire the transport USS George F. Elliot (which sank two days later) and heavily damaging the destroyer USS Jarvis. In the air attacks over the two days, the Japanese lost 36 aircraft, while the U.S. lost 19, both in combat and to accident, including 14 carrier fighters. That night, as the transports unloaded, two groups of screening Allied cruisers and destroyers, under the command of British Rear Admiral Victor Crutchley VC, were surprised and defeated by a Japanese force of seven cruisers and one destroyer from the 8th Fleet based at Rabaul and Kavieng and commanded by Japanese Vice Admiral Gunichi Mikawa. In the Battle of Savo Island one Australian and three American cruisers were sunk and one American cruiser and two destroyers were damaged. The Japanese suffered moderate damage to one cruiser. Mikawa, who was unaware Fletcher was preparing to withdraw with the U.S. carriers, immediately retired to Rabaul without attempting to attack the transports. Mikawa was concerned about daylight U.S. carrier air attacks if he remained in the area. Bereft of his carrier air cover, Turner decided to withdraw his remaining naval forces by the evening of 9 August and in so doing left the Marines ashore without much of the heavy equipment, provisions and troops still aboard the transports. Mikawa's decision not to attempt to destroy the Allied transport ships when he had the opportunity proved to be a crucial strategic mistake. The 11,000 Marines on Guadalcanal initially concentrated on forming a loose defensive perimeter around Lunga Point and the airfield, moving the landed supplies within the perimeter and finishing the airfield. In four days of intense effort, the supplies were moved from the landing beach into dispersed dumps within the perimeter. Work began on the airfield immediately, mainly using captured Japanese equipment. On 12 August the airfield was named Henderson Field after Lofton R. Henderson, a Marine aviator who was killed during the Battle of Midway. By 18 August the airfield was ready for operation. Five days worth of food had been landed from the transports, which, along with captured Japanese provisions, gave the Marines a total of 14 days worth of food. To conserve supplies, the troops were limited to two meals per day. Allied troops encountered a severe strain of dysentery soon after the landings, with one in five Marines afflicted by mid-August. Tropical diseases would affect the fighting strengths of both sides throughout the campaign. Although some of the Korean construction workers surrendered to the Marines, most of the remaining Japanese and Korean personnel gathered just west of the Lunga perimeter on the west bank of the Matanikau River and subsisted mainly on coconuts. A Japanese naval outpost was also located at Taivu Point, about 35 kilometers (22 mi) east of the Lunga perimeter. On 8 August, a Japanese destroyer from Rabaul delivered 113 naval reinforcement troops to the Matanikau position. On the evening of 12 August, a 25-man U.S. Marine patrol, led by Division D-2 Lieutenant Colonel Frank Goettge and primarily consisting of intelligence personnel, landed by boat west of the Lunga perimeter, between Point Cruz and the Matanikau River, on a reconnaissance mission with a secondary objective of contacting a group of Japanese troops that U.S. forces believed might be willing to surrender. Soon after the patrol landed, a nearby platoon of Japanese naval troops attacked and almost completely wiped out the Marine patrol. 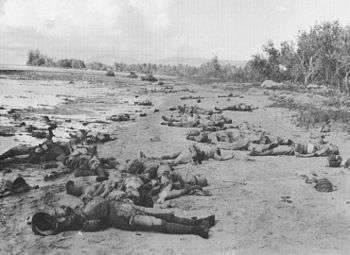 Dead Japanese soldiers on the sandbar at the mouth of Alligator Creek, Guadalcanal after the Battle of the Tenaru. Underestimating the strength of Allied forces on Guadalcanal, Ichiki's unit conducted a nighttime frontal assault on Marine positions at Alligator Creek (often called the "Ilu River" on U.S. Marine maps) on the east side of the Lunga perimeter in the early morning hours of 21 August. Ichiki's assault was defeated with heavy Japanese losses in what became known as the Battle of the Tenaru. After daybreak, the Marine units counterattacked Ichiki's surviving troops, killing many more of them. The dead included Ichiki, though it has been claimed that he committed seppuku after realizing the magnitude of his defeat, rather than dying in combat. In total, 789 of the original 917 members of the Ichiki Regiment's First Element were killed in the battle. The 128 survivors returned to Taivu Point, notified 17th Army headquarters of their defeat and awaited further reinforcements and orders from Rabaul. The carrier USS Enterprise (CV-6) under aerial attack during the Battle of the Eastern Solomons. As the Tenaru battle was ending, more Japanese reinforcements were already on their way. Admiral Isoroku Yamamoto put together a very powerful expeditionary force. Their aim was to destroy any American fleet units in the area, and then eliminate Henderson Field. This force sortied from Truk on 23 August. Simultaneously, several other reinforcement, support, and bombardment groups sortied from both Truk and Rabaul. Three slow transports departed from Truk on 16 August carrying the remaining 1,400 soldiers from Ichiki's (28th) Infantry Regiment plus 500 naval marines from the 5th Yokosuka Special Naval Landing Force. The transports were guarded by 13 warships commanded by Japanese Rear Admiral Raizō Tanaka, who planned to land the troops on Guadalcanal on 24 August. To cover the landings of these troops and provide support for the operation to retake Henderson Field from Allied forces, Yamamoto directed Chūichi Nagumo to sortie with a carrier force from Truk on 21 August and head towards the southern Solomon Islands. Nagumo's force included three carriers and 30 other warships. Simultaneously, three U.S. carrier task forces under Fletcher approached Guadalcanal to counter the Japanese offensive efforts. The American forces only had two carriers, which were the Saratoga and Enterprise, and their 176 aircraft to meet the two Japanese fleet carriers Shōkaku and Zuikaku and the light carrier Ryūjō. The Japanese had 177 aircraft. On 24 and 25 August, the two carrier forces fought the Battle of the Eastern Solomons, which resulted in both fleets retreating from the area after taking some damage, with the Japanese losing one light aircraft carrier. Yamamoto next sent the light carrier named Ryūjō on a bait role ahead of the rest of the fleet, and sending its planes to attack Guadalcanal. This drew attention from the American pilots. Meanwhile, the aircraft from the two fleet carriers would next charge in to attack the Americans. The bait carrier Ryūjō was overwhelmed. It was hit by several 1,000 pound bombs then subsequently was hit by an aerial torpedo. The ship was then abandoned and eventually sank that same night. Tanaka's convoy, after suffering heavy damage during the battle from an air attack by CAF aircraft from Henderson Field, including the sinking of one of the transports, was forced to divert to the Shortland Islands in the northern Solomons in order to transfer the surviving troops to destroyers for later delivery to Guadalcanal. The Japanese had launched an air raid on Guadalcanal, causing chaos and havoc, while American Marine aircraft had engaged Tanaka's convoy which was headed by the flagship Jintsū near Taivu Point. A Japanese transport was sunk. The older destroyer Mutsuki was so badly damaged that it had to be scuttled. Several other warships were damaged including Tanaka's own Jintsū. At this point, Tanaka withdrew and rescheduled the supply run for the night of 28 August via the destroyers. Meanwhile, the American carrier Wasp positioned itself east of Guadalcanal expecting Japanese movement there. However, there was none to be found. Strategically, the Japanese had an opportunity here for a decisive victory. However, they failed to achieve it. They allowed the Americans to step away with a view of victory. In addition, the reinforcement of Henderson Field of Guadalcanal by Enterprise's aircraft established a precedent. This made daylight supply runs to Guadalcanal impossible for Japanese shipments. Only weeks before this, the Japanese had total control of the sea in this particular region; now they were forced to make supply runs only under the cover of darkness. U.S. Marine Grumman F4F Wildcats from Henderson Field preparing to attack incoming Japanese aircraft in late August or early September 1942. Throughout August, small numbers of U.S. aircraft and their crews continued to arrive at Guadalcanal. By the end of August, 64 aircraft of various types were stationed at Henderson Field. On 3 September, the commander of 1st Marine Aircraft Wing, U.S. Marine Brigadier General Roy S. Geiger, arrived with his staff and took command of all air operations at Henderson Field. Air battles between the Allied aircraft at Henderson and Japanese bombers and fighters from Rabaul continued almost daily. Between 26 August and 5 September, the U.S. lost about 15 aircraft while the Japanese lost approximately 19 aircraft. More than half of the downed U.S. aircrews were rescued while most of the Japanese aircrews were never recovered. The eight-hour round trip flight from Rabaul to Guadalcanal, about 1,120 miles (1,800 km) total, seriously hampered Japanese efforts to establish air superiority over Henderson Field. Australian coastwatchers on Bougainville and New Georgia islands were often able to provide Allied forces on Guadalcanal with advance notice of inbound Japanese air strikes, allowing the U.S. fighters time to take off and position themselves to attack the Japanese bombers and fighters as they approached the island. Thus, the Japanese air forces were slowly losing a war of attrition in the skies above Guadalcanal. The other relocated battalion, the 1st Battalion, 5th Marine Regiment (1/5), was landed by boat west of the Matanikau near Kokumbuna village on 27 August with the mission of attacking Japanese units in the area, much as in the first Matanikau action of 19 August. In this case, however, the Marines were impeded by difficult terrain, hot sun, and well-emplaced Japanese defenses. The next morning, the Marines found that the Japanese defenders had departed during the night, so the Marines returned to the Lunga perimeter by boat. Losses in this action were 20 Japanese and 3 Marines killed. Small Allied naval convoys arrived at Guadalcanal on 23 August, 29 August, 1 September, and 8 September to provide the Marines at Lunga with more food, ammunition, aircraft fuel, and aircraft technicians. The convoy on 1 September also brought 392 construction engineers to maintain and improve Henderson Field. Between 29 August and 4 September, various Japanese light cruisers, destroyers, and patrol boats were able to land almost 5,000 troops at Taivu Point, including most of the 35th Infantry Brigade, much of the Aoba (4th) Regiment, and the rest of Ichiki's regiment. General Kawaguchi, who landed at Taivu Point on 31 August Express run, was placed in command of all Japanese forces on Guadalcanal. A barge convoy took another 1,000 soldiers of Kawaguchi's brigade, under the command of Colonel Akinosuke Oka, to Kamimbo, west of the Lunga perimeter. Meanwhile, native scouts under the direction of Martin Clemens, a coastwatcher officer in the Solomon Islands Protectorate Defense Force and the British district officer for Guadalcanal, brought reports to the U.S. Marines of Japanese troops at Taivu near the village of Tasimboko. Edson planned a raid on the Japanese troop concentration at Taivu. On 8 September, after being dropped-off near Taivu by boat, Edson's men captured Tasimboko as the Japanese defenders retreated into the jungle. In Tasimboko, Edson's troops discovered Kawaguchi's main supply depot, including large stockpiles of food, ammunition, medical supplies, and a powerful shortwave radio. After destroying everything in sight, except for some documents and equipment carried back with them, the Marines returned to the Lunga perimeter. The mounds of supplies along with intelligence gathered from the captured documents informed the Marines that at least 3,000 Japanese troops were on the island and apparently planning an attack. Edson, along with Colonel Gerald C. Thomas, Vandegrift's operations officer, correctly believed that the Japanese attack would come at a narrow, grassy, 1,000 yards (910 m)-long, coral ridge that ran parallel to the Lunga River located just south of Henderson Field. The ridge, called Lunga Ridge, offered a natural avenue of approach to the airfield, commanded the surrounding area and, at that time, was almost undefended. On 11 September, the 840 men of Edson's battalion were deployed onto and around the ridge. Two companies from Kawaguchi's 2nd Battalion charged up the southern edge of the ridge and pushed Edson's troops back to Hill 123 on the center part of the ridge. Throughout the night Marines at this position supported by artillery defeated wave after wave of frontal Japanese attacks, some of which resulted in hand-to-hand fighting. Japanese units that infiltrated past the ridge to the edge of the airfield were also repulsed. Attacks by the Kuma battalion and Oka's unit at other locations on the Lunga perimeter were also defeated. On 14 September Kawaguchi led the survivors of his shattered brigade on a five-day march west to the Matanikau Valley to join with Oka's unit. In total Kawaguchi's forces lost about 850 killed and the Marines 104. On 15 September Hyakutake at Rabaul learned of Kawaguchi's defeat and forwarded the news to Imperial General Headquarters in Japan. In an emergency session the top Japanese IJA and IJN command staffs concluded that "Guadalcanal might develop into the decisive battle of the war". The results of the battle now began to have a telling strategic impact on Japanese operations in other areas of the Pacific. Hyakutake realized that in order to send sufficient troops and matériel to defeat the Allied forces on Guadalcanal he could not at the same time support the major ongoing Japanese offensive on the Kokoda Track in New Guinea. Hyakutake, with the concurrence of General Headquarters, ordered his troops on New Guinea who were within 30 miles (48 km) of their objective of Port Moresby to withdraw until the "Guadalcanal matter" was resolved. Hyakutake prepared to send more troops to Guadalcanal for another attempt to recapture Henderson Field. As the Japanese regrouped west of the Matanikau, the U.S. forces concentrated on shoring up and strengthening their Lunga defenses. 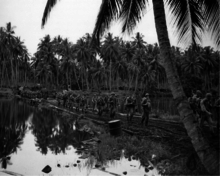 On 14 September Vandegrift moved another battalion, the 3rd Battalion, 2nd Marine Regiment (3/2), from Tulagi to Guadalcanal. On 18 September an Allied naval convoy delivered 4,157 men from the 3rd Provisional Marine Brigade (the 7th Marine Regiment plus a battalion from the 11th Marine Regiment and some additional support units), 137 vehicles, tents, aviation fuel, ammunition, rations and engineering equipment to Guadalcanal. These crucial reinforcements allowed Vandegrift, beginning on 19 September, to establish an unbroken line of defense around the Lunga perimeter. While covering this convoy the aircraft carrier USS Wasp was sunk by the Japanese submarine I-19 southeast of Guadalcanal, temporarily leaving only one Allied aircraft carrier (USS Hornet) in operation in the South Pacific area. Vandegrift also made some changes in the senior leadership of his combat units, transferring off the island several officers who did not meet his performance standards and promoting junior officers who had proven themselves to take their places. One of these was the recently promoted Colonel Merritt Edson who was placed in command of the 5th Marine Regiment. The first U.S. Marine operation conducted between 23 and 27 September by elements of three U.S. Marine battalions, an attack on Japanese forces west of the Matanikau, was repulsed by Kawaguchi's troops under Akinosuke Oka's local command. During the action three Marine companies were surrounded by Japanese forces near Point Cruz west of the Matanikau, took heavy losses, and barely escaped with assistance from the destroyer USS Monssen and landing craft manned by U.S. Coast Guard personnel. U.S. cruiser Helena, part of Task Force 64 under Norman Scott. Mikawa's 8th Fleet staff scheduled a large and important Express run for the night of 11 October. Two seaplane tenders and six destroyers were to deliver 728 soldiers plus artillery and ammunition to Guadalcanal. 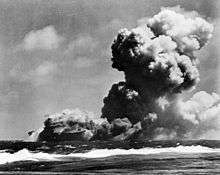 At the same time but in a separate operation three heavy cruisers and two destroyers under the command of Rear Admiral Aritomo Gotō were to bombard Henderson Field with special explosive shells with the object of destroying the CAF and the airfield's facilities. Because U.S. Navy warships had yet to attempt to interdict any Tokyo Express missions to Guadalcanal, the Japanese were not expecting any opposition from Allied naval surface forces that night. Despite the U.S. victory off Cape Esperance, the Japanese continued with plans and preparations for their large offensive scheduled for later in October. The Japanese decided to risk a one-time departure from their usual practice of only using fast warships to deliver their men and materiel to the island. On 13 October, a convoy comprising six cargo ships with eight screening destroyers departed the Shortland Islands for Guadalcanal. The convoy carried 4,500 troops from the 16th and 230th Infantry Regiments, some naval marines, two batteries of heavy artillery, and one company of tanks. To protect the approaching convoy from attack by CAF aircraft, Yamamoto sent two battleships from Truk to bombard Henderson Field. At 01:33 on 14 October, Kongō and Haruna, escorted by one light cruiser and nine destroyers, reached Guadalcanal and opened fire on Henderson Field from a distance of 16,000 meters (17,500 yd). Over the next one hour and 23 minutes, the two battleships fired 973 14-inch (356 mm) shells into the Lunga perimeter, most of them falling in and around the 2,200 meters (2,400 yd) square area of the airfield. Many of the shells were fragmentation shells, specifically designed to destroy land targets. The bombardment heavily damaged both runways, burned almost all of the available aviation fuel, destroyed 48 of the CAF's 90 aircraft, and killed 41 men, including six CAF pilots. The battleship force immediately returned to Truk. In spite of the heavy damage, Henderson personnel were able to restore one of the runways to operational condition within a few hours. Seventeen SBDs and 20 Wildcats at Espiritu Santo were quickly flown to Henderson and U.S. Army and Marine transport aircraft began to shuttle aviation gasoline from Espiritu Santo to Guadalcanal. Now aware of the approach of the large Japanese reinforcement convoy, the U.S. desperately sought some way to interdict the convoy before it could reach Guadalcanal. Using fuel drained from destroyed aircraft and from a cache in the nearby jungle, the CAF attacked the convoy twice on the 14th, but caused no damage. Between 1 and 17 October, the Japanese delivered 15,000 troops to Guadalcanal, giving Hyakutake 20,000 total troops to employ for his planned offensive. Because of the loss of their positions on the east side of the Matanikau, the Japanese decided that an attack on the U.S. defenses along the coast would be prohibitively difficult. Therefore, Hyakutake decided that the main thrust of his planned attack would be from south of Henderson Field. His 2nd Division (augmented by troops from the 38th Division), under Lieutenant General Masao Maruyama and comprising 7,000 soldiers in three infantry regiments of three battalions each was ordered to march through the jungle and attack the American defences from the south near the east bank of the Lunga River. The date of the attack was set for 22 October, then changed to 23 October. To distract the Americans from the planned attack from the south, Hyakutake's heavy artillery plus five battalions of infantry (about 2,900 men) under Major General Tadashi Sumiyoshi were to attack the American defenses from the west along the coastal corridor. The Japanese estimated that there were 10,000 American troops on the island, when in fact there were about 23,000. On 12 October, a company of Japanese engineers began to break a trail, called the "Maruyama Road", from the Matanikau towards the southern portion of the U.S. Lunga perimeter. The 15 miles (24 km) long trail traversed some of the most difficult terrain on Guadalcanal, including numerous rivers and streams, deep, muddy ravines, steep ridges, and dense jungle. Between 16 and 18 October, the 2nd Division began their march along the Maruyama Road. 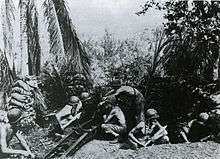 By 23 October, Maruyama's forces still struggled through the jungle to reach the American lines. That evening, after learning that his forces had yet to reach their attack positions, Hyakutake postponed the attack to 19:00 on 24 October. The Americans remained completely unaware of the approach of Maruyama's forces. Finally, late on 24 October Maruyama's forces reached the U.S. Lunga perimeter. Over two consecutive nights Maruyama's forces conducted numerous, unsuccessful frontal assaults on positions defended by troops of the 1st Battalion, 7th Marines under Lieutenant Colonel Chesty Puller and the U.S. Army's 3rd Battalion, 164th Infantry Regiment, commanded by Lieutenant Colonel Robert Hall. U.S. Marine and Army units armed with rifles, machine guns, mortars, artillery, including direct canister fire from 37 mm anti-tank guns "wrought terrible carnage" on the Japanese. A few small groups of Japanese broke through the American defenses, but were all hunted down and killed over the next several days. More than 1,500 of Maruyama's troops were killed in the attacks while the Americans lost about 60 killed. Over the same two days American aircraft from Henderson Field defended against attacks by Japanese aircraft and ships, destroying 14 aircraft and sinking a light cruiser. 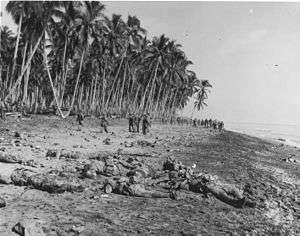 Dead Japanese Army soldiers lie near the mouth of the Matanikau after a failed attack on U.S. Marine positions on Guadalcanal on October 23–24, 1942. Further Japanese attacks near the Matanikau on 26 October were also repulsed with heavy losses for the Japanese. As a result, by 08:00 on 26 October, Hyakutake called off any further attacks and ordered his forces to retreat. About half of Maruyama's survivors were ordered to retreat back to the upper Matanikau Valley while the 230th Infantry Regiment under Colonel Toshinari Shōji was told to head for Koli Point, east of the Lunga perimeter. Leading elements of the 2nd Division reached the 17th Army headquarters area at Kokumbona, west of the Matanikau on 4 November. The same day, Shōji's unit reached Koli Point and made camp. Decimated by battle deaths, combat injuries, malnutrition, and tropical diseases, the 2nd Division was incapable of further offensive action and fought as a defensive force along the coast for the rest of the campaign. In total the Japanese lost 2,200–3,000 troops in the battle while the Americans lost around 80 killed. At the same time that Hyakutake's troops were attacking the Lunga perimeter, Japanese aircraft carriers and other large warships under the overall direction of Isoroku Yamamoto moved into a position near the southern Solomon Islands. From this location, the Japanese naval forces hoped to engage and decisively defeat any Allied (primarily U.S.) naval forces, especially carrier forces, that responded to Hyakutake's ground offensive. Allied naval carrier forces in the area, now under the overall command of William Halsey, Jr., also hoped to meet the Japanese naval forces in battle. Nimitz had replaced Ghormley with Halsey on 18 October after concluding that Ghormley had become too pessimistic and myopic to effectively continue leading Allied forces in the South Pacific area. U.S. Marines drag the bodies of dead Japanese soldiers from their bunker in the Point Cruz area after the battle in early November. On 5 November, Vandegrift ordered Carlson to take his raiders, march overland from Aola, and attack any of Shōji's forces that had escaped from Koli Point. With the rest of the companies from his battalion, which arrived a few days later, Carlson and his troops set off on a 29-day patrol from Aola to the Lunga perimeter. During the patrol, the raiders fought several battles with Shōji's retreating forces, killing almost 500 of them, while suffering 16 killed themselves. In addition to the losses sustained from attacks by Carlson's raiders, tropical diseases and a lack of food felled many more of Shōji's men. By the time Shōji's forces reached the Lunga River in mid-November, about halfway to the Matanikau, only 1,300 men remained with the main body. When Shōji reached the 17th Army positions west of the Matanikau, only 700 to 800 survivors were still with him. Most of the survivors from Shōji's force joined other Japanese units defending the Mount Austen and upper Matanikau River area. Tokyo Express runs on 5, 7 and 9 November, delivered additional troops from the Japanese 38th Infantry Division, including most of the 228th Infantry Regiment to Guadalcanal. These fresh troops were quickly emplaced in the Point Cruz and Matanikau area and helped successfully resist further attacks by American forces on 10 and 18 November. The Americans and Japanese remained facing each other along a line just west of Point Cruz for the next six weeks. Around 01:30 on 13 November, Callaghan's force intercepted Abe's bombardment group between Guadalcanal and Savo Island. In addition to the two battleships, Abe's force included one light cruiser and 11 destroyers. In the pitch darkness, the two warship forces intermingled before opening fire at unusually close quarters. In the resulting mêlée, Abe's warships sank or severely damaged all but one cruiser and one destroyer in Callaghan's force and both Callaghan and Scott were killed. Two Japanese destroyers were sunk and another destroyer and Hiei heavily damaged. 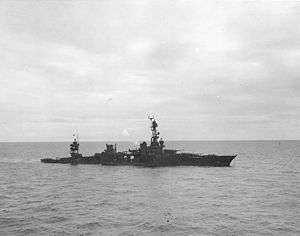 In spite of his defeat of Callaghan's force, Abe ordered his warships to retire without bombarding Henderson Field. Hiei sank later that day after repeated air attacks by CAF aircraft and aircraft from the U.S. carrier Enterprise. Because of Abe's failure to neutralize Henderson Field, Yamamoto ordered the troop transport convoy, under the command of Raizo Tanaka and located near the Shortland Islands, to wait an additional day before heading towards Guadalcanal. Yamamoto ordered Nobutake Kondō to assemble another bombardment force using warships from Truk and Abe's force to attack Henderson Field on 15 November. In the meantime, around 02:00 on 14 November, a cruiser and destroyer force under Gunichi Mikawa from Rabaul conducted an unopposed bombardment of Henderson Field. The bombardment caused some damage but failed to put the airfield or most of its aircraft out of operation. As Mikawa's force retired towards Rabaul, Tanaka's transport convoy, trusting that Henderson Field was now destroyed or heavily damaged, began its run down the slot towards Guadalcanal. Throughout the day of 14 November, aircraft from Henderson Field and Enterprise attacked Mikawa's and Tanaka's ships, sinking one heavy cruiser and seven of the transports. Most of the troops were rescued from the transports by Tanaka's escorting destroyers and returned to the Shortlands. After dark, Tanaka and the remaining four transports continued towards Guadalcanal as Kondo's force approached to bombard Henderson Field. In order to intercept Kondo's force, Halsey, who was low on undamaged ships, detached two battleships, Washington and South Dakota, and four destroyers from the Enterprise task force. The U.S. force, under the command of Willis A. Lee aboard Washington, reached Guadalcanal and Savo Island just before midnight on 14 November, shortly before Kondo's bombardment force arrived. Kondo's force consisted of Kirishima plus two heavy cruisers, two light cruisers, and nine destroyers. After the two forces made contact, Kondo's force quickly sank three of the U.S. destroyers and heavily damaged the fourth. The Japanese warships then sighted, opened fire, and damaged South Dakota. As Kondo's warships concentrated on South Dakota, Washington approached the Japanese ships unobserved and opened fire on Kirishima, smashing into the Japanese battleship repeatedly with both main and secondary battery shells, and causing fatal damage. After fruitlessly chasing Washington towards the Russell Islands, Kondo ordered his warships to retire without bombarding Henderson Field. One of Kondo's destroyers was also sunk during the engagement. The Eighth Fleet's Guadalcanal Reinforcement Unit (the Tokyo Express), then commanded by Raizo Tanaka, was tasked by Mikawa with making the first of five scheduled runs to Tassafaronga on Guadalcanal using the drum method on the night of 30 November. Tanaka's unit was centered on eight destroyers, with six destroyers assigned to carry between 200 and 240 drums of supplies apiece. 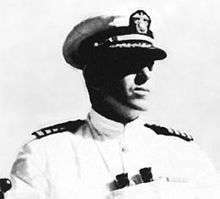 Notified by intelligence sources of the Japanese supply attempt, Halsey ordered the newly formed Task Force 67, comprising four cruisers and four destroyers under the command of U.S. Rear Admiral Carleton H. Wright, to intercept Tanaka's force off Guadalcanal. 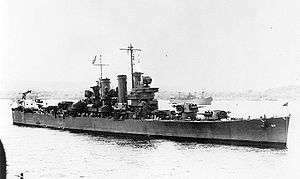 Two additional destroyers joined Wright's force en route to Guadalcanal from Espiritu Santo during the day of 30 November. By 7 December 1942, Hyakutake's forces were losing about 50 men each day from malnutrition, disease, and Allied ground or air attacks. Further attempts by Tanaka's destroyer forces to deliver provisions on 3, 7 and 11 of December, failed to alleviate the crisis, and one of Tanaka's destroyers was sunk by a U.S. PT boat torpedo. U.S. Army Major General Alexander Patch (center) succeeds Vandegrift (right) on 9 December 1942. The U.S. Army's 182nd Infantry Regiment on the march during the Battle of Guadalcanal. The Allies renewed the offensive on 10 January, reattacking the Japanese on Mount Austen as well as on two nearby ridges called the Seahorse and the Galloping Horse. After some difficulty, the Allies captured all three by 23 January. At the same time, U.S. Marines advanced along the north coast of the island, making significant gains. The Americans lost about 250 killed in the operation while the Japanese suffered around 3,000 killed–about 12 to 1 in the Americans' favor. USS Chicago sinking on 30 January during the Battle of Rennell Island. Patch, wary of what he thought to be an imminent Japanese offensive, committed only a relatively small portion of his troops to continue a slow-moving offensive against Hyakutake's forces. On 29 January, Halsey, acting on the same intelligence, sent a resupply convoy to Guadalcanal screened by a cruiser task force. Sighting the cruisers, Japanese naval torpedo bombers attacked that same evening and heavily damaged the cruiser Chicago. The next day, more torpedo aircraft attacked and sank Chicago. Halsey ordered the remainder of the task force to return to base and directed the rest of his naval forces to take station in the Coral Sea, south of Guadalcanal, to be ready to counter the perceived Japanese offensive. In the meantime, the Japanese 17th Army withdrew to the west coast of Guadalcanal while rear guard units checked the American offensive. On the night of 1 February, a force of 20 destroyers from Mikawa's 8th Fleet under Shintarō Hashimoto successfully extracted 4,935 soldiers, mainly from the 38th Division, from the island. The Japanese and Americans each lost a destroyer from air and naval attacks related to the evacuation mission. On the nights of 4 and 7 February, Hashimoto and his destroyers completed the evacuation of most of the remaining Japanese forces from Guadalcanal. Apart from some air attacks, Allied forces, still anticipating a large Japanese offensive, did not attempt to interdict Hashimoto's evacuation runs. 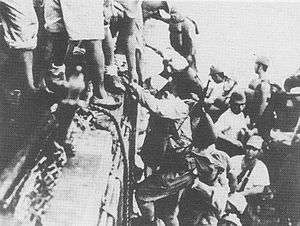 In total, the Japanese successfully evacuated 10,652 men from Guadalcanal. On 9 February, Patch realized that the Japanese were gone and declared Guadalcanal secure for Allied forces, ending the campaign. After the Japanese withdrawal, Guadalcanal and Tulagi were developed into major bases supporting the Allied advance further up the Solomon Islands chain. In addition to Henderson Field, two additional fighter runways were constructed at Lunga Point and a bomber airfield was built at Koli Point. Extensive naval port and logistics facilities were established at Guadalcanal, Tulagi, and Florida. The anchorage around Tulagi became an important advanced base for Allied warships and transport ships supporting the Solomon Islands campaign. Major ground units were staged through large encampments and barracks on Guadalcanal before deployment further up the Solomons. After Guadalcanal the Japanese were clearly on the defensive in the Pacific. The constant pressure to reinforce Guadalcanal had weakened Japanese efforts in other theaters, contributing to a successful Australian and American counteroffensive in New Guinea which culminated in the capture of the key bases of Buna and Gona in early 1943. The Allies had gained a strategic initiative which they never relinquished. In June, the Allies launched Operation Cartwheel, which, after modification in August 1943, formalized the strategy of isolating Rabaul and cutting its sea lines of communication. The subsequent successful neutralization of Rabaul and the forces centered there facilitated the South West Pacific campaign under General Douglas MacArthur and Central Pacific island hopping campaign under Admiral Chester Nimitz, with both efforts successfully advancing toward Japan. The remaining Japanese defenses in the South Pacific area were then either destroyed or bypassed by Allied forces as the war progressed to its ultimate conclusion. The Battle of Guadalcanal was one of the first prolonged campaigns in the Pacific, alongside the related and concurrent Solomon Islands campaign. Both campaigns were battles that strained the logistical capabilities of the combatant nations involved. For the U.S., this need prompted the development of effective combat air transport for the first time. A failure to achieve air superiority forced Japan to rely on reinforcement by barges, destroyers, and submarines, with very uneven results. Early in the campaign, the Americans were hindered by a lack of resources, as they suffered heavy losses in cruisers and carriers, with replacements from ramped-up shipbuilding programs still months away from materializing. Henderson Field in August 1944. After the victory at the Battle of Midway, America was able to establish naval parity in the Pacific. However, this fact alone did not change the direction of the war. It was only after the Allied victories in Guadalcanal and New Guinea that the Japanese offensive thrust was ended and the strategic initiative passed to the Allies, as it proved, permanently. The Guadalcanal Campaign ended all Japanese expansion attempts and placed the Allies in a position of clear supremacy. It thus can be argued that this Allied victory was the first step in a long string of successes that eventually led to the surrender of Japan and the occupation of the Japanese home islands. 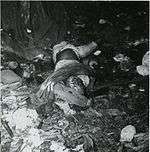 A dead Japanese soldier on Guadalcanal in January 1943. The "Europe first" policy of the United States had initially only allowed for defensive actions against Japanese expansion, in order to focus resources on defeating Germany. However, Admiral King's argument for the Guadalcanal invasion, as well as its successful implementation, convinced President Franklin D. Roosevelt that the Pacific Theater could be pursued offensively as well. By the end of 1942, it was clear that Japan had lost the Guadalcanal campaign, a serious blow to Japan's strategic plans for defense of their empire and an unanticipated defeat at the hands of the Americans. The Guadalcanal Campaign was the subject of large amount of high quality news reporting. News agencies sent some of their most talented writers, as it was the first major US combat operation of the war. Richard Tregaskis who wrote for International News Service gained fame with the publication of his bestselling Guadalcanal Diary in 1943. Hanson Baldwin, a Navy correspondent, filed stories for The New York Times and won a Pulitzer Prize for his coverage of the early days of WWII. Tom Yarbrough wrote for the Associated Press, Bob Miller for the United Press, John Hersey for Time and Life, Ira Wolfert for the North American Newspaper Alliance (his series of articles about the November 1942 Naval Battle of Guadalcanal won him the Pulitzer Prize), Sergeant James Hurlbut for the Marine Corps, and Mack Morriss for Yank magazine. Commander Vandegrift placed few restrictions on the reporters who were generally allowed to go wherever they wanted and write what they wanted. ↑ Garamone, Jim (9 November 2010). "Mullen Thanks Tonga for Steadfast Support". U.S. Navy. Retrieved 19 August 2016. ↑ Parshall, Jon. "Title". combinedfleet.com. Retrieved 23 September 2016. 1 2 3 Dyer; v.1, p. 261. ↑ See, Morrison, Breaking the Bismarcks Barrier. pp. 3–5. ↑ Dyer; v.1, p. 259. 1 2 Dyer; v.1, pp. 259—260. ↑ Dyer; v.1, p. 260. ↑ Bowen, James. Despite Pearl Harbor, America adopts a 'Germany First' strategy. America Fights Back. The Pacific War from Pearl Harbor to Guadalcanal. Pacific War Historical Society. Retrieved 30 December 2007. ↑ Morison, p. 12, Frank, pp. 15–16, Miller, Cartwheel, p. 5. ↑ Murray, pp. 199–200; Jersey, p. 85; and Lundstrom, p. 5. ↑ Frank, pp. 35–37, 53. ↑ Morison, p. 15; and McGee, pp. 20–21. ↑ Frank, pp. 57, 619–621. ↑ Frank, p. 60; Jersey, p. 95. The landing force, designated Task Force 62, included six heavy cruisers, two light cruisers, 15 destroyers, 13 transports, six cargo ships, four destroyer transports, and five minesweepers. ↑ Frank, p. 50. The IJN personnel included Japanese and Korean construction specialists as well as trained combat troops. ↑ Shaw, p. 8–9; and McGee, p. 32–34. ↑ Frank, p. 79. Approximately 80 Japanese personnel escaped to Florida Island, where they were found and killed by Marine patrols over the next two months. ↑ Jersey, p. 113–115, 190, 350; Morison, p. 15; and Frank, p. 61–62 & 81. ↑ Hammel, p. 99; and Loxton, p. 104–5. Loxton, Frank (p. 94), and Morison (p. 28) contend Fletcher's fuel situation was not at all critical, but Fletcher implied it was in order to provide further justification for his withdrawal from the battle area. ↑ Smith, p. 14–15. At this time there were exactly 10,819 Marines on Guadalcanal (Frank, p. 125–127). ↑ Zimmerman, p. 58–60; Smith, p. 35; and Jersey, p. 196–199. Goettge was one of the first killed. Only three made it back to the Lunga Point perimeter. Seven Japanese were killed in the skirmish. More details of the event are at: Clark, Jack, "Goettge Patrol", Pacific Wreck Database and Broderson, Ben, "Franklin native recalls key WWII battle". Archived 14 April 2015 at the Wayback Machine. ↑ Frank, p. 132–133; Jersey, p. 203; and Smith, p. 36–42. The 500 Japanese involved were from the 84th Guard Unit, 11th and 13th Construction Units, and the recently arrived 1st Camp Relief Unit. After this engagement the Japanese naval personnel relocated deeper into the hills in the interior of the island. ↑ Frank, p. 156–158 & 681; and Smith, p. 43. 1 2 3 4 5 6 7 Chen, C. Peter. "Solomon Islands Campaign: 23 August 1942 – 25 December 1943". World War II Database. Retrieved 11 September 2015. ↑ Zimmerman, p. 70; and Frank, p. 159. ↑ Hammel, pp. 124–125, 157. ↑ Hara, pp. 118–119; and Hough, p. 293. An unknown, but "large" number of the 5th Yokosuka troops were killed in the sinking of their transport ship. ↑ Morison, p. 15; and Hough, p. 298. ↑ Smith, p. 103; and Hough, p. 298. ↑ Smith, pp. 79, 91–92 & 94–95. ↑ Griffith, p. 113; and Frank, pp. 198–199, 205, and 266. The term "rat transportation" was used because, like a rat, the Japanese ships were active at night. The 35th Infantry Brigade, from the 18th Division, contained 3,880 troops and was centered on the 124th Infantry Regiment with various attached supporting units (Alexander, p. 139). ↑ Frank, pp. 201–203; Griffith, pp. 116–124; and Smith, pp. 87–112. ↑ Frank, pp. 219–220; and Smith, pp. 113–115 & 243. Most of the men in Ichiki's second echelon were from Asahikawa, Hokkaidō. "Kuma" refers to the brown bears that lived in that area. ↑ Frank, p. 220; and Smith, p. 121. ↑ Zimmerman, p. 80; and Griffith, p. 125. ↑ Hough, pp. 298–299; Frank, pp. 221–222; Smith, p. 129; and Griffith, pp. 129–130. ↑ Griffith, pp. 130–132; Frank, pp. 221–222; and Smith, p. 130. ↑ Frank, pp. 223 & 225–226; Griffith, pp. 132 & 134–135; and Smith, pp. 130–131, 138. ↑ Smith, pp. 161–167. The Marine defenders that finally defeated Kokusho's charge were most likely from the 11th Marines with assistance from the 1st Pioneer Battalion (Smith, p. 167; and Frank, p. 235). ↑ Smith, pp. 162–193; Frank, pp. 237–246; and Griffith, pp. 141–147. ↑ Griffith, p. 144; and Smith, pp. 184–194. ↑ Evans, pp. 179–180; Frank, pp. 247–252; Griffith, p. 156; and Smith, pp. 198–200. ↑ Griffith, pp. 152; Frank, pp. 224, 251–254, & 266; Jersey, pp. 248–249; and Smith, pp. 132 & 158. ↑ Smith, p. 204; and Frank, p. 270. ↑ Smith, pp. 204–215; Frank, pp. 269–274; Zimmerman, pp. 96–101. ↑ Griffith, pp. 169–176; Frank, pp. 282–290; and Hough, pp. 318–322. ↑ Rottman, p. 61; Griffith, p. 152; Frank, pp. 224, 251–254, 266–268, & 289–290; Dull, pp. 225–226; and Smith, pp. 132 & 158. ↑ Frank, pp. 293–297; Morison, p. 147–149; and Dull, p. 225. Since not all of the Task Force 64 warships were available, Scott's force was designated as Task Group 64.2. The U.S. destroyers were from Squadron 12, commanded by Captain Robert G. Tobin in Farenholt. ↑ Frank, pp. 295–296; Hackett, HIJMS Aoba: Tabular Record of Movement; Morison, pp. 149–151; D'Albas, p. 183; and Dull, p. 226. ↑ Frank, p. 299–324; Morison, p. 154–171; and Dull, p. 226–230. ↑ Frank, pp. 313–315. The 16th was from the 2nd Division and the 230th from the 38th Division. ↑ Evans, pp. 181–182; Frank, pp. 315–320; Morison, pp. 171–175. 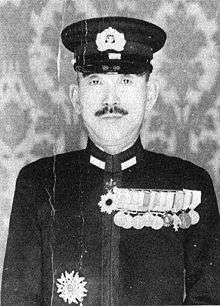 Raizo Tanaka commanded Destroyer Squadron 2 which was part of the battleship's screen. ↑ Frank, pp. 321–326; Hough, pp. 327–328. ↑ Shaw, p. 34; and Rottman, p. 63. ↑ Rottman, p. 61; Frank, pp. 289–340; Hough, pp. 322–330; Griffith, pp. 186–187; Dull, pp. 226–230; Morison, p. 149–171. The Japanese troops delivered to Guadalcanal during this time comprised the entire 2nd (Sendai) Infantry Division, two battalions from the 38th Infantry Division, and various artillery, tank, engineer, and other support units. Kawaguchi's forces also included what remained of the 3rd Battalion, 124th Infantry Regiment, which was originally part of the 35th Infantry Brigade commanded by Kawaguchi during the Battle of Edson's Ridge. ↑ Miller, p. 155; Frank, pp. 339–341; Hough, p. 330; Rottman, p. 62; Griffith, pp. 187–188. Hyakutake sent a member of his staff, Colonel Masanobu Tsuji to monitor the 2nd Division's progress along the trail and to report to him on whether the attack could begin on 22 October as scheduled. Masanobu Tsuji has been identified by some historians as the most likely culprit behind the Bataan death march. ↑ Griffith, p. 193; Frank, pp. 346–348; Rottman, p. 62. ↑ Hough, pp. 332–333; Frank, p. 349–350; Rottman, pp. 62–63; Griffith, pp. 195–196; Miller, pp. 157–158. The Marines lost 2 killed in the action. Japanese infantry losses are not recorded but were, according to Frank, "unquestionably severe." 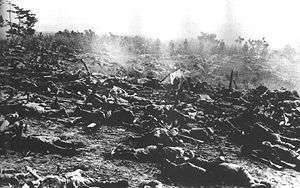 Griffith says that 600 Japanese soldiers were killed. Only 17 of the 44 members of the 1st Independent Tank Company survived the battle. ↑ Hough, p. 336; Frank, pp. 353–362; Griffith, pp. 197–204; Miller, pp. 147–151, 160–162; Lundstrom, pp. 343–352. The 164th became the first Army unit to engage in combat in the war and was later awarded the Presidential Unit Citation. ↑ Frank, 3pp. 63–406, 418, 424, and 553; Zimmerman, pp. 122–123; Griffith, p. 204; Hough, p. 337; Rottman, p. 63. Silver Star medals were awarded to Sgt. Norman Greber of Ohio, Pvt. Don Reno of Texas, Pvt. Jack Bando of Oregon, Pvt. Stan Ralph of New York, and Cpl. Michael Randall of New York for their actions during the battle. ↑ Morison, pp. 199–207; Frank, pp. 368–378; Dull, pp. 235–237. ↑ Dull, pp. 237–244; Frank, pp. 379–403; Morison, pp. 207–224. ↑ Hough, p. 343; Hammel, p. 135; Griffith, pp. 214–215; Frank, p. 411; Anderson; Shaw, pp. 40–41; Zimmerman, pp. 130–131. ↑ Shaw, pp. 40–41; Griffith, pp. 215–218; Hough, pp. 344–345; Zimmerman, pp. 131–133; Frank, pp. 412–420; Hammel, pp. 138–139. ↑ Zimmerman, pp. 133–138; Griffith, pp. 217–219; Hough, pp. 347–348; Frank, pp. 414–418; Miller, pp. 195–197; Hammel, p. 141; Shaw, pp. 41–42; Jersey, p. 297. Jersey states that the troops landed were from the 2nd Company, 230th Infantry commanded by 1st Lt Tamotsu Shinno plus the 6th Battery, 28th Mountain Artillery Regiment with the two guns. ↑ Zimmerman, pp. 133–141; Griffith, pp. 217–223; Hough, pp. 347–350; Frank, pp. 414–423; Miller, pp. 195–200; Hammel, pp. 141–144; Shaw, pp. 41–42; Jersey, pp. 297–305. ↑ Hough, pp. 348–350; Shaw, pp. 42–43; Frank, pp. 420–424; Griffith, p. 246; Miller, pp. 197–200; Zimmerman, pp. 136–145, Jersey, p. 361. ↑ Frank, pp. 420–421, 424–25, 493–497; Anderson; Hough, pp. 350–358; Zimmerman, pp. 150–152. ↑ Hammel, pp. 38–39; Frank, pp. 429–430. The American reinforcements totaled 5,500 men and included the 1st Marine Aviation Engineer Battalion, replacements for ground and air units, the 4th Marine Replacement Battalion, two battalions of the U.S. Army's 182nd Infantry Regiment, and ammunition and supplies. ↑ Frank, p. 432; Hammel, pp. 50–90. ↑ Frank, pp. 428–461; Hammel, pp. 103–401; Hara, pp. 137–156. ↑ Frank, pp. 465–474; Hammel, pp. 298–345. The American air sorties were possible due to a supply of 488 55-gallon drums of 100-octane gas that was hidden in a secluded area under the jungle canopy by Cub-1 sailor, August Martello. ↑ Hammel, pp. 349–395; Frank, pp. 469–486. ↑ Frank, pp. 484–488, 527; Hammel, pp. 391–395. ↑ Dull, p. 261, Frank, pp. 497–499. On 24 December, the 8th Fleet, 11th Air Fleet, and all other Japanese naval units in the New Guinea and Solomon Islands areas were combined under one command, designated the Southeast Area Fleet with Jinichi Kusaka in command. ↑ Brown, p. 124–125, USSBS, p. 139, Roscoe, p. 206, Dull, p. 262, Crenshaw, p. 26–33, Kilpatrick, p. 139–142, Morison, p. 294–296, Frank, p. 504. ↑ Jersey, p. 384; Frank, pp. 536–538; Griffith, p. 268; Hayashi, pp. 62–64; Toland, p. 426. ↑ Hayashi, pp. 62–64; Griffith, p. 268; Frank, pp. 534–539; Toland, pp. 424–426; Dull, p. 261; Morison, pp. 318–321. During the conference with Sugiyama and Nagano, the Emperor asked Nagano, "Why was it that it took the Americans just a few days to build an air base and the Japanese more than a month or so?" (The IJN originally occupied Guadalcanal and began constructing the airfield). Nagano apologized and replied that the Americans had used machines while the Japanese had to rely on manpower (Toland, p. 426.). ↑ Frank, pp. 247–252, 293, 417–420, 430–431, 521–522, 529; Griffith, pp. 156, 257–259, 270; Miller, pp. 143, 173–177, 183, 189, 213–219; Jersey, pp. 304–305, 345–346, 363, 365; Hough, pp. 360–362; Shaw, pp. 46–47; Zimmerman, pp. 156–157, 164. The Americal Division infantry regiments were National Guard units. The 164th was from North Dakota, the 182nd from Massachusetts, and the 132nd from Illinois. The 147th had previously been part of the 37th Infantry Division. During its time on Guadalcanal, the 1st Marine Division suffered 650 killed, 31 missing, 1,278 injured, and 8,580 who contracted some type of disease, mainly malaria. The 2nd Marine Regiment had arrived at Guadalcanal with most of the 1st Marine Division, but remained behind to rejoin its parent unit, the 2nd Marine Division. The U.S. Army's 25th Infantry Division's 35th Regiment arrived at Guadalcanal on 17 December, the 27th Regiment on 1 January, and the 161st Regiment on 4 January. The 2nd Marine Division's headquarters units, the 6th Marine Regiment, and various Marine weapons and support units also arrived on 4 and 6 January. U.S. Major General John Marston, commander of the 2nd Marine Division, remained in New Zealand because he was superior in time in rank to Patch. Instead, Brigadier General Alphonse De Carre commanded the 2nd Marine Division on Guadalcanal. The total number of Marines on Guadalcanal and Tulagi on 6 January 1943 was 18,383. ↑ Frank, pp. 529–534; Miller, pp. 231–237, 244, 249–252; Jersey, pp. 350–351; Anderson, Hough, pp. 363–364; Griffith, pp. 263–265. ↑ Frank, pp. 563–567; Miller, pp. 290–305; Jersey, pp. 367–371. ↑ Miller, p. 338; Frank, pp. 540–560; Morison, pp. 333–339; Rottman, p. 64; Griffith, pp. 269–279; Jersey, pp. 384–388; Hayashi, p. 64. ↑ Hough, pp. 367–368; Frank, pp. 568–576; Miller, pp. 319–342; Morison, pp. 342–350. After unloading their cargo, the U.S. transports evacuated the 2nd Marine Regiment from the island, which had been on Guadalcanal since the beginning of the campaign. ↑ Frank, pp. 582–588, 757–758; Jersey, pp. 376–378; Morison, pp. 364–368; Miller, pp. 343–345; Zimmerman, p. 162; Dull, p. 268. ↑ Frank, pp. 589–597; Jersey, pp. 378–383, 383, 400–401; Miller pp. 342–348. ↑ U.S. Navy, Building the Navy's Bases in World War II, pp. 246–256. ↑ Hough, p. 374; Zimmerman, p. 166. 1 2 Murray, p. 215; Hough, p. 372. ↑ Kuwahara, Masatoshi (2015-05-26). "Ex-soldier recalls Guadalcanal as 'island of death'". Japan Times. Archived from the original on 2015-05-29. Retrieved 2016-11-26. 1 2 Hough, p. 372; Miller, p. 350; Zimmerman, p. 166. ↑ Willmott, Barrier and the Javelin, pp. 522–523; Parshall and Tully, Shattered Sword, pp. 416–430. ↑ Willmott, H. P; Robin Cross; Charles Messenger (2006) . "American Offensives in the Pacific". In Dennis Cowe. World War II. London: Dorling Kindersley. pp. g. 208. ISBN 1-4053-1262-9. ; Miller, p. 350; Shaw, p. 52; Alexander, p. 81. 1 2 3 4 Ian W. Toll (2015). "Four". The Conquering Tide. W. W. Norton. pp. 120–121. Dyer, George Carroll (1972). The Amphibians Came to Conquer: The Story of Admiral Richmond Kelly Turner (PDF). Fleet Marine Force Reference Publication (FMFRP 12-109-11). 1. Washington: Department of the Navy. LCCN 71603853. Retrieved 18 August 2015. Hadden, Robert Lee. 2007. "The Geology of Guadalcanal: a Selected Bibliography of the Geology, Natural History, and the History of Guadalcanal." Alexandria, Virginia: Topographic Engineering Center. 360 pages. Lists sources of information regarding the bodies of the US Marines of the Lt Col. Frank B. Goettge Reconnaissance patrol that was ambushed in August 1942. Morison, Samuel Eliot, Breaking the Bismarcks Barrier, 22 July 1942 — 1 May 1944, vol. VI of History of United States Naval Operations in World War II. Boston: Little, Brown and Company 1950. Miller, John Jr. (1995) . 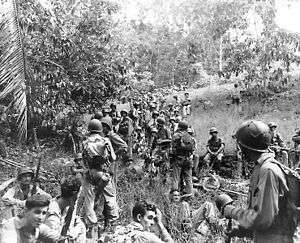 Guadalcanal: The First Offensive. United States Army in World War II. United States Army Center of Military History. Retrieved 4 July 2006. Garrett, James R. "James R. "Rube" Garrett A Marine Diary: My Experiences on Guadalcanal". An Eyewitness Account of the Battle of Guadalcanal. Adams, M. Clay (Director) (1952). Victory at Sea- Episode 6: Guadalcanal (Video documentary). National Broadcasting Company (NBC) Film. One episode from a 26-episode series about naval combat during World War II. Malick, Terrence (Director) (1998). The Thin Red Line (Feature-length film). 20th Century Fox Home Entertainment. Film adaptation of James Jones' fictional, dramatic novel of the same title set on Guadalcanal. Marton, Andrew (Director) (1964). The Thin Red Line (Feature-length film). Allied Artists Pictures. Film adaptation of James Jones' fictional, dramatic novel of the same title set on Guadalcanal. Ray, Nicholas (Director) (1951). Flying Leathernecks (Feature-length film). RKO Radio Pictures. Fictional drama about U.S. Marine pilots involved in the Battle of Guadalcanal. Seiler, Lewis (Director) (1943). Guadalcanal Diary (Feature-length film). 20th Century Fox Film Corporation. Film adaptation of Tregaskis' book referenced in "Books" section above. Shootout! Season 1, Guadalcanal (TV series). The Lost Evidence Episode 20 (TV series).